Instead of trying to blog everyday for the 30 Days of Creativity challenge I am going to do a weekly wrap-up entry here. If you want to see my daily entries as they happen, you can check out the Twitter feed I set up for the challenge. Day One: I heart Kentucky block print. The first day of the challenge just so happened to be Kentucky's birthday so I created a linocut of the state and printed cards. Day Two: dyeing with red onion skins. I did blog this one- here. Day Three: turning a Navajo spindle. My fist disc on the lathe. I had some issues with the grain, mainly me trying to make the wood do what I wanted instead of doing what the wood wanted, but overall I am happy with the result. 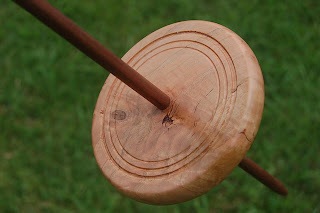 It is a 30" spindle weighing 5.45oz with a cherry whorl and a walnut shaft and it's totally balanced. 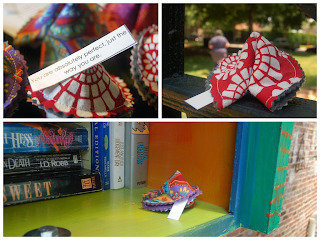 Day Four: fabric fortune cookies. This was a joint effort with my friend Jessi. We made fabric fortune cookies, filled them with fortunes and compliments and hid them around downtown for others to find. Day Five: dyeing Lincoln locks. I bought a bunch of Lincoln locks at the Kentucky Sheep and Fiber fest last month and I am slowly dyeing them up in bright colors for future projects. 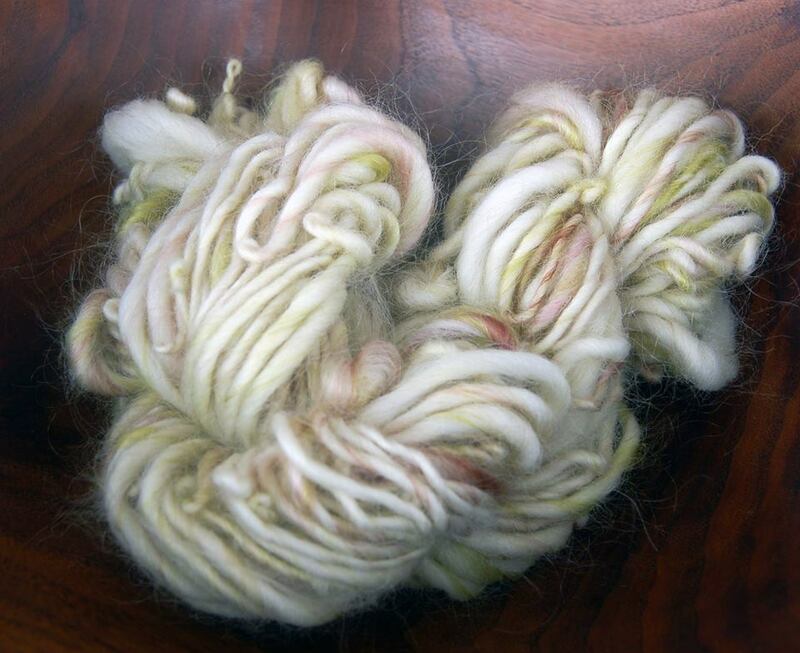 Day Six: overspun mohair single. Spun from a mohair/wool cloud I carded, it is the beginning of a future project. Day Seven: spray painting my bike basket and adding some crochet heart streamers. My original plan was to paint my bike bell, but I couldn't resist spray painting the basket and adding some streamers as well. I painted the bell, but it was a failure so I will have to sand it down and try it again on another day.